This is the Calendar 2018 page. We start the year with a cartoon of none other than Simon Reeve on the BBC’s Arctic Live programme. This year he has been in trouble for telling fibs about Reindeer decline. Last year he was telling us it was warm in the Arctic. Next we have snowflakes getting all shook up by President Trump, something that seems to have been happening all year – at least they are in a safe space. On the right and on a similar theme we have ‘The Inconsolables’, how America voted for Trump despite all the alarmist rhetoric and damage to the environment – maybe it was because of it. Below that a cartoon on the infamous ‘alternative facts’ phrase used by Kellyanne Conway – we have had a whole year of them. The final cartoon is one from the end of COP22 in 2016 – a plea for the main issue in climate, money. Top left is a cartoon on the Green blob’s fear of Trump and his sensible attitude to fossil fuels. In the centre is one of my favourite cartoons of the year “Are EU Green?” – a mad cartoon for the truly mad outcome of renewable energy targets – burning ‘protected’ forests. To the right is James Delingpole, climate expert, and all round brilliant journalist who week by week incisively uncovers the rottenness of Climate change activism and the Green blob. Bottom right is a small cartoon at a talk – I forget which one! The idea is that the man made contribution to CO2 levels is like… And on the far left a lovely lump of coal – Mother nature’s battery. Top left, end-to-end encryption is suitably cryptic – there were stories (e.g. this one) about governments needing to be able to read everyone’s social media so I thought how we used to chat back when we first started thinking it might be a fun idea. Top right, I was commissioned to do a cartoon about noisy wind turbines in Hawaii – not such a paradise after all. Bottom right, a cartoon about the extraordinary way the media don’t ask what Roger Pielke Jr – they make it up instead, bizarre. Bottom left is another commission for this website – the idea is that science, and specifically the greenhouse- warming hypothesis, needs experiments. If we hadn’t gone to the moon we might still think it was made of cheese. Left, a story about Greenpeace knowing what they were saying was fake news, up on WUWT here. Top right, is a cartoon about a fascinating video with Judith Curry, Roger Pielke Jr, John Christy and Michael Mann testifying before Congress in which Michael Mann is less than frank. Bottom right is how to create a climate science graph using El Nino and El Nina – always big up the El Nino 😉 The last cartoon, in the middle, is Climate 101 – a take on a picture that was tweeted around that time. Surely not? What did I do in May that was so busy? My apologies! Top left, a cartoon on Biofuels. As it happens this has been in the news recently with an interesting talk by Gerrard Cornelis van Kooten. You can watch it here. And here are my cartoon notes – [click on the image for the high res version]. Right centre is a heart cartoon for tweeting whenever you want to point out a Fake News tweet in an inoffensive way. Unusual, I know. To the right is Uncertainty Mann – how the uncertainty monster living in Michael Mann’s data eats him up. Bottom centre, Mann again, telling us how distinguished he is. Leo Hickman, a cartoon regular, makes an appearence this month using ‘Absurd Absolutes’, which Scott Adams tells us is a sign of coginitve dissonance. One of my favourite cartoons this year – Save Our Bats, featuring Batman and Robin. Top right, Bill Nye, US TV presenter, says have less children. Bottom right our wee Mann skips through life in and out of the Paris Accord. Bottom centre he contemplates CO2 greening the planet, growing more food and saving millions of lives. And lastly bottom left, Theresa May, will or probably won’t, succeed in her battle with the EU dragon. She is not the only one battling the dragon so maybe, just maybe. I know, it’s now November! I think I will have to do this differently next year rather than try to remember every month. My excuse is that I have had an incredibly busy second half of the year with little time to do much else but work. It is also that there are much fewer links to stories on blogs and I now do more cartoons for Twitter or books. This month there were four cartoons. On the left the EU negotiating dragon. As Brexit has droned on over the year we have all become worn out and terminally bored by the constant panic in the news. The EU now seem less like a dragon and more like a bemused onlooker wondering how the UK Governemt could be quite so hapless and disorganised. Theresa May toyed with the idea of a price cap on energy but they might like to check out the £600 added to everyone’s bills each year in Green levies. Lastly two Mann (our everymann alarmist) cartoons – anthropogenic rainfall and a realisation that we probably have 6000 years of fossil fuels left. From left to right clockwise. A Red Team on climate – sounds sensible. Aparently polar bears are getting too fat to be a climate change icon – they only like the starving kind. The BBC routinely manlges climate science. Climate alarmist blogger Bart Verheggen does not like the very excellent Marijn Poels film “The Uncertainty has setlled”. Trump goes in the direction of leaving the Paris climate accord and everyone realiese it was a dud anyway. Finally Brian Cox is right – there isn’t a meaningful debate on ‘the science’. I blame him! Five cartoons! Did you know the CO2 theory is more of an untested hypothesis rather than a theory? George Monbiot, a favourite to cartoon, wants to kill all farms animals. Why do environmentalists want to kill things so much? Sadly a few months later George told us he had prostate cancer for which he has now had treatment and he writes very movingly about it here. He is a great advocate for a lot of good things – we disagree on the ‘how’ rather than the ‘what’ and I appreciate his fine writing and being fun to cartoon. I wish him a speedy recovery and a very long remission. David Davis, now not in post, and Michel Barnier do some negotiating – well, Barnier speaks, we listen. Another character I love drawing is Jeremy Corbyn – old and curmudgeonly, with proper mad ideas, he is a cartoonist’s idea of fun! Here he throws his brother, Piers, out of the Labour party. Hilarious. Lastly poor old Theresa May falls into one of Jeremy’s manholes. I rather like her – she puts up with so much flak from the children and is probably the best headmistress PM we have ever had. Six cartoons! Guess what environmentalists think the answer is to intermittent renewables? Diesel. Unbelieveable. Even Sir David King admitted he had got the diesel policy wrong. Well, yes. And, as James Delingpole would say, we are right about everything else as well. Next. Our problem is extreme poverty not extreme weather – 3 billion is nearly half the planet, not good. There was a ‘March for Science’ but it looked like anything but. And Fake News – lots of that around these days. 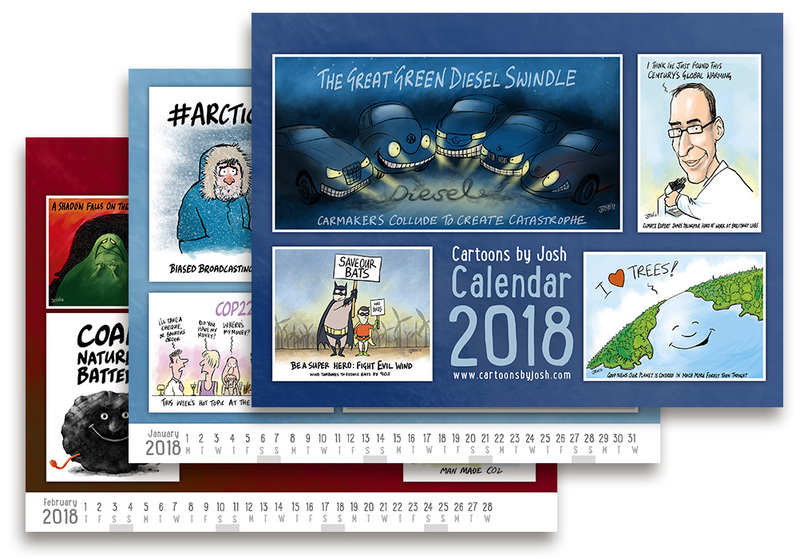 Finally another cartoon (another of the year’s favourites) on the Great Green Diesel Swindle – it turns out it wasnt just VW but all the other carmakers too. As I write James Dyson has won a legal battle against the EU about their testing regime. Here is a link. Climate Chnage Impacts: it’s not much of a challenge is it – feeling a bit sad. More on Fake News – cooking up a half-baked fake climate gingerbread mann. Carbon Tax – would it do anything or just be more mindless virture signalling? And lastly a planet happy to have more trees. We all love trees and there are more of them than ever before 😉 well, at least in the last 100 years. And that’s it for another year! See you on the next page.